planet Gallifrey who explores time and space in his TARDIS spaceship, combating evil foes, solving problems, and righting wrongs. 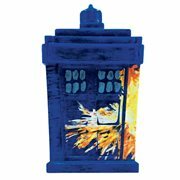 Dr. Who merchandise has followed all 13 incarnations of the Doctor, from William Hartnell, Tom Baker, and Christopher Eccleston to Matt Smith, Peter Capaldi, and Jodie Whittaker, and all those in-between. 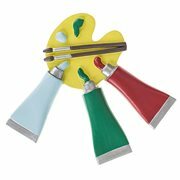 The place to find these marvelous items is here, and the time to do so is now! Doctor Who is a science-fiction television series produced by the BBC since 1963. It follows the adventures of a mysterious Time Lord called "the Doctor," a being from the planet Gallifrey who explores time and space in his TARDIS spaceship, combating evil foes, solving problems, and righting wrongs. Dr. Who merchandise has followed all 13 incarnations of the Doctor, from William Hartnell, Tom Baker, and Christopher Eccleston to Matt Smith, Peter Capaldi, and Jodie Whittaker, and all those in-between. The place to find these marvelous items is here, and the time to do so is now! 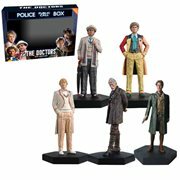 A significant part of British (and other) pop culture, the show has spawned innumerable spinoffs, films, video games, books, audios, museums, and exhibitions, plus Doctor Who action figures and other items for sale like you'll discover at Entertainment Earth. Even without the power of regeneration or the ability to time travel, we've been able to assemble a terrific selection of books, diaries, prop replicas, sonic screwdrivers, busts, statues, clothing, knapsacks, posters, ornaments, dishware, mugs, lunch boxes, and all sorts of timey-wimey Doctor Who toys and other products that make excellent presents or rewards for all your hard work. Take a look! Which Are Your Favorite Doctor Who Villains? Would they include Davros' Daleks, the Cybermen, The Master, or one of the myriad of other villains, creatures, and aliens from the series? 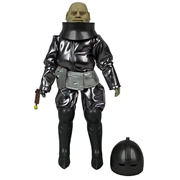 Regardless, you're likely to find them among the Dr. Who collectible figures on these web pages. Hang Out with the Doctor. As any true-blue Whovian knows, the Doctor typically travels with a (usually human) companion like Rose Tyler, Amy Pond, or Clara Oswald, who among other things reminds the Doctor of his "moral duty." Maybe that could be you, should you gather enough Doctor Who memorabilia around you. Wouldn't that be cool? 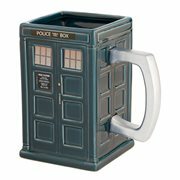 Our Doctor Who Collection Is Bigger on the Inside. Like the Doctor's famous TARDIS, there's more to see inside our Doctor Who collection than you might think. 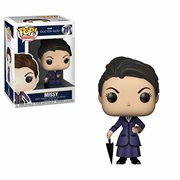 Look for Funko Pop! Vinyl figures, Playmobil figures, plush, games, model kits, nutcrackers, Bluetooth speakers, Underground Toys Doctor Who items, bobbleheads, glassware, barware, water bottles, banks, coloring books, wallets, masks, watches, beanies, and oh so much more. You really do have to see it to believe it. Time's a wastin', so like the Doctor said, "Do what I do. Hold tight and pretend it's a plan!" Then don one of your Doctor Who T-shirts and get on with your shopping. "Allons-y!"